Portrait of William Hipkins hanging in the Lakewood History Museum. Crossing the Atlantic, marching through Georgia with General Sherman, settling in remote Washington Territory…William Hipkins definitely got around! William Herbert Hipkins was born August 8, 1843 in Staffordshire, England to Stephen and Eliza Brown Hipkins. The family emigrated to America, arriving in New York on the ship Ivanhoe on March 12, 1849 from Liverpool, England. William was the third youngest of seven children. Three more children were born in the United States. At the age of 19, William enlisted in the Union Army as a private with Company A, 43rd Regiment, Ohio Infantry on December 19, 1861. 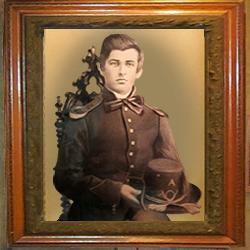 He was promoted to corporal on June 1, 1865 and mustered out on July 13, 1865. Hipkin’s war-time diaries were donated to the Washington State Historical Society’s special collection room decades ago. In one of the entries, we learn Hipkins’ legs froze during Sherman's famous march to the sea--even Georgia sometimes sees snow, and the winter of 1864 was particularly brutal. He spent several weeks in hospital and received a medal for his injuries. Another entry tells how Hipkins sent home $1.50, a whopping sum in those days, to help his parents make do without him during the war years. He met and married Liveria Cox on February 15, 1869 in Belmont County, Ohio. They had six children. The four oldest were born in Ohio, the fifth in Kansas. In the 1880 Census he was living in Minneapolis--not the one in Minnesota, but another by that name in Ottawa County, Kansas. The youngest and only son, Stephen Herbert Hipkins was born July 10, 1884 in Pierce County, Washington, where Hipkins had moved his family when he received a land claim just west of Steilacoom Lake, better known as Byrd’s Lake at that time. The family farm was at what is now Hipkins Road and 95th Street in Lakewood. Hipkins donated part of his land for the construction of the prairie road, dedicated in 1898. The homestead burned down around 1908. According to the 1885 Washington Territorial Census, William had moved and was living in Tacoma, his occupation listed as carpenter. He became a naturalized citizen of the United States on October 8, 1892. William Hipkins died on April 26, 1901 at age 57 of peritonitis, probably caused by a ruptured appendix, and is buried in the Old Tacoma Cemetery. Give him a thought the next time you drive down the road named after him.